Despite the significant improvement concerning perioperative mortality, pancreatoduodenectomy is still a challenging procedure. Pancreatic fistula is the most common complication underlying 30-day mortality. 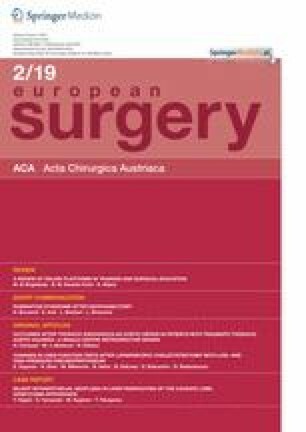 More than 61 surgical techniques of pancreatic anastomosis with a vast number of variations have been published. Moreover, various risk factors favoring the development of postoperative pancreatic fistulas have been identified. This review article presents an outline of ways to achieve the optimal pancreatic anastomosis, concentrating on technical aspects. The following parameters were assessed in this question: pancreatojejunostomy, pancreaticogastrostomy, stents, tissue patches and sealants, surgical experience, and center-specific technique. With regard to current literature, there is no scientific evidence of an optimal pancreatic anastomotic technique. A distinct inhomogeneity among the trials concerning definitions, patient selection, anastomotic technique, and patient management is important to mention. The best strategy for reducing pancreatic fistula rate includes a standardized institutional concept of pancreatic anastomosis, documentation of surgical quality, and continuous enhancement by benchmarking. H. Wundsam, C. S. Rösch, I. Fischer, and R. Függer declare that they have no competing interests.